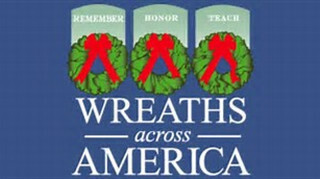 What is Wreaths Across America? WAA is a 501(c)3 non-profit organization formed in 2007 as an extension of The Arlington Wreath Project, with over 1,100 participating locations in all 50 states, and 24 national veteran cemeteries on foreign soil. What began in 1992 with a trailer load of wreaths, decorated by volunteers and laid at the graves of fallen soldiers at Arlington National Cemetery (See: The Arlington Story - How the Arlington Wreath Project was born) has now become a national organization with over 1,100 participating locations - all focused on the mission to Remember , Honor, and Teach. REMEMBER our fallen U.S. veterans. TEACH your children the value of freedom. When we lay wreathes on veterans' graves, we say their names. A person dies twice: once when they take their final breath, and later, the last time their name is spoken. We encourage every volunteer who places a wreath on a veteran's grave to say that veteran's name aloud and take a moment to thank them for their service to our country. It's a small act that goes a long way toward keeping the memory of our veterans alive. We are not here to “decorate graves." We're here to remember not their deaths, but their lives. We can't do it without you. Whether you are a single individual, a corporation, a volunteer group, a trucker or a trucking company, there are plenty of ways you can get involved in helping us honor and remember our nation's fallen servicemen and women. An act of kindness throws out roots in all directions, and the roots spring up and make new trees.